The Riverhounds completed the season sweep of Toronto FC II with a 3-1 win on Saturday in Ontario, Canada, as they’ve now continued their up and down season to their second win after three straight losses. Here are a few takeaways from this past week’s game — as they remain in playoff position with opportunities to move up and inch closer to fourth place, but also have in-state rivals Harrisburg, coming off a 3-2 win over Richmond, right on their heels as well. 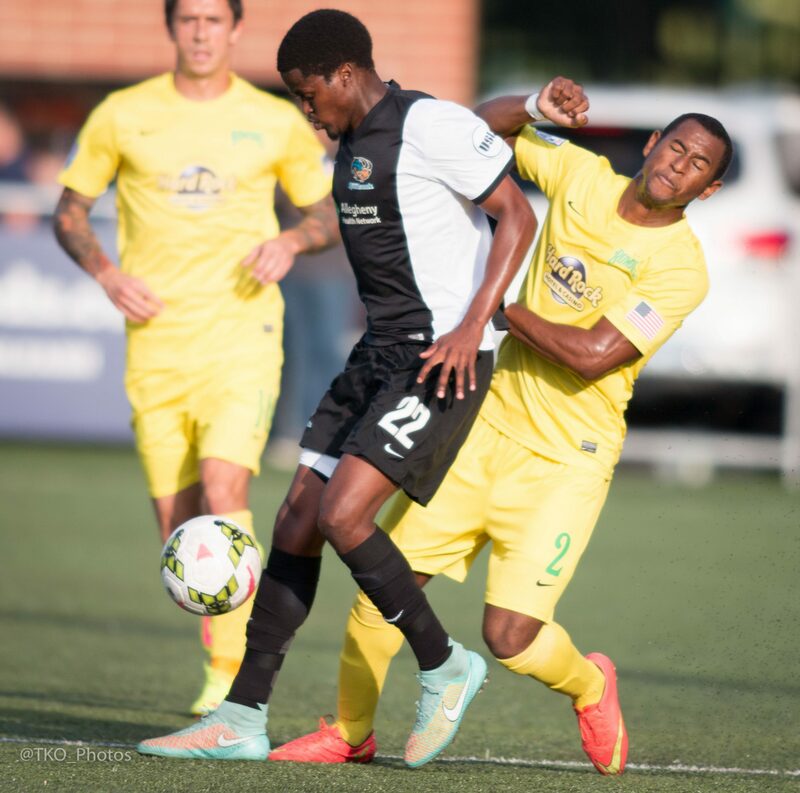 Lebo Moloto has come on strong for the Riverhounds — now has three goals and seven assists. The Riverhounds attack this year has been terrific. They’re leading the United Soccer League (USL) in goals scored. Much of the credit has already been given to Head Coach Mark Steffens and his staff for their tactics (primarily utilizing a 4-2-3-1 formation which has provided the three attacking midfielders with lots of freedom and creativity) — and of course to Rob Vincent, who has ascended to the top of the USL goal scoring charts and Kevin Kerr, who is the league leader in assists with nine. But one player that has also thrived in his role in the attacking midfield, is Lebo Moloto. The South African native has been the man in the middle, between Vincent and Kerr. He has at times been very creative on the ball — and a dangerous presence at the top of the attack to the tune of three goals and seven assists. Still relatively young, at age 22, Moloto is starting to find his groove in his first full professional season, playing along side players who’ve had more experience at this level (Kerr 26, Vincent 24). His coming out party of sorts came during the Riverhounds remarkable 6-5 comeback victory on May 31 over Harrisburg when he was responsible for three assists. Often defending units have to account for Vincent who roams along the left flank and Kerr on the right side, leaving Moloto with opportunities in the middle of the field. While some of his play had been inconsistent at times, especially when learning how to play against big, strong and well-organized defensive teams like Rochester and Louisville, Moloto has shown he can be an outstanding player at this level. On Saturday, he had another stellar game — having been a part of each of the Riverhounds three goals with two assists and a goal. He set up the first goal to find Vincent with a simple ball played back. After all isn’t that what all of the Riverhounds attackers are always looking for as Vincent has been automatic this season? For the game’s second tally, Kerr provided a nice through ball for Moloto, who beat the goalkeeper Quillan Roberts with a nice one-time shot just inside the left post. Moloto’s work on the third goal really stood out as a very high cross was played into the box, Miro Cabrilo was able to head it in the air to keep it in the box. Moloto then beat two Toronto defenders to the ball with superb first touch with his right foot, made a terrific move to his left to draw a pair of defenders, then sent the ball through the two defenders with his left foot on the second touch to Cabrilo who beat Roberts for the 3-0 lead. As long as Vincent, Kerr and Moloto are all in top form, the Riverhounds will be a dangerous team for USL defenders to keep dealing with. We’ve been here before. Just when it seemed like things were back to normal with the Riverhounds goalkeeping situation, as rookie Calle Brown had come off a fourth clean sheet, and it would seem to be a matter of time before Ryan Thompson was back in net after his run of play with Jamaican National Team in Gold Cup. Steffens said after beating Wilmington, that Thompson would be the main guy as long as he’s healthy. Unfortunately, it appears that Thompson’s knee continues to give him some problems. So, it came as a bit of a surprise to see that the Riverhounds went out to pick up Mexican Under-20 national team goalkeeper Jesse Gonzalez — and see that he was entered into the starting lineup after arriving on loan from F.C. Dallas this week. Gonzalez did very good work for the Hounds, and only conceded a goal in the very late stages that was an absolute screamer. It will be interesting to see what will happen in the coming weeks. The final third of the season will provide for the ultimate test for the Riverhounds (9-8-4, 31 points). They’ve been up and down all season long. With two straight wins, they suddenly can see the teams in front of them — as well as still have to deal with a few teams that are behind them that can quickly close the gap. If they can play with any consistency, they will be able to make a run at the elusive fourth place spot — and an opportunity to host at least one home playoff game. Getting into the playoffs is the first goal of course — but the chance to host a home playoff game should be excellent motivation. The Hounds have been playing before bigger crowds as the second half of the season rolls on. With four of their final six games on the road, it won’t be easy. Ultimately, the Riverhounds control their own destiny, although Harrisburg does have two games at hand (only played 19 games to the Hounds 21). But the Hounds have played one less game than the two teams in front of them (Richmond, and NY Red Bulls II, who they will hold tiebreaker advantages). One thing about being the league’s top goal scoring team, they can hold their share of tiebreakers. Of course, there’s a lot that can happen between now and September 19. There’s only one team that’s not in the playoff hunt that they will play going forward. And that’s still at Wilmington, where they historically never play well. It will be interesting to see how the Hounds approach each game — and to see how results oriented they get and how they deal with late game situations whether they are playing for three points or to be content to hold on for a tie. But that final Saturday Keystone Derby match in Harrisburg — in a series that has seen 25 goals, thrilling comebacks in the first three games — could provide for some incredible drama on the season’s final day.